Empowering patients who have been diagnosed with cancer is what Bag It is all about. In 2003, our Founder, Sherri Romanoski, just a few short years after her own cancer diagnosis, left her career as a kindergarten teacher and committed to becoming an advocate for newly diagnosed cancer patients. After traversing her own journey, she understood the importance of accessible, reliable information and the power of self-advocacy. Today, Sherri’s organization works to help every cancer patient find your very own voice. To empower you with the right information, right when you need it. To provide resources so you can Fight the Fear. And to help every one of you become the very best member of your own care team. The National Coalition of Cancer Survivorship defines Survivorship as the process of living with, through, and beyond a cancer diagnosis. Regardless of whether you were diagnosed today or decades ago, you are a Survivor. Bag It’s focus on Survivorship means our materials and resources go beyond the medical and clinical needs of each patient and address a whole range of topics, such as dealing with emotions, financial challenges, talking to your employer, and more. Whatever type of cancer, whenever your date of diagnosis, you are a survivor, and our Bag It bag, Bag It Resource Center, and the Bag It Community will all provide access to resources to support your physical, practical, and emotional needs. Knowledge. Fellowship. Courage. Hope. Empowerment. The initial diagnosis. The Bag It Bag is often given to patients by their medical provider. An oncology nurse navigator or another member of the oncology team will walk through the Bag It materials and show you how to utilize the My Companion Guidebook as an invaluable organizational tool, as well as the four resource booklets that come with the bag. If your medical provider does not provide the Bag It bag, you can also order directly from us. Bag It patients find great value in getting the Bag It materials at the time of diagnosis. But the materials are designed to inform, empower, and help patients THRIVE throughout treatment and beyond. Self-advocacy means giving yourself the tools and information you need to feel confident about asking questions, communicating your needs, and participating as the strongest member of your care team. 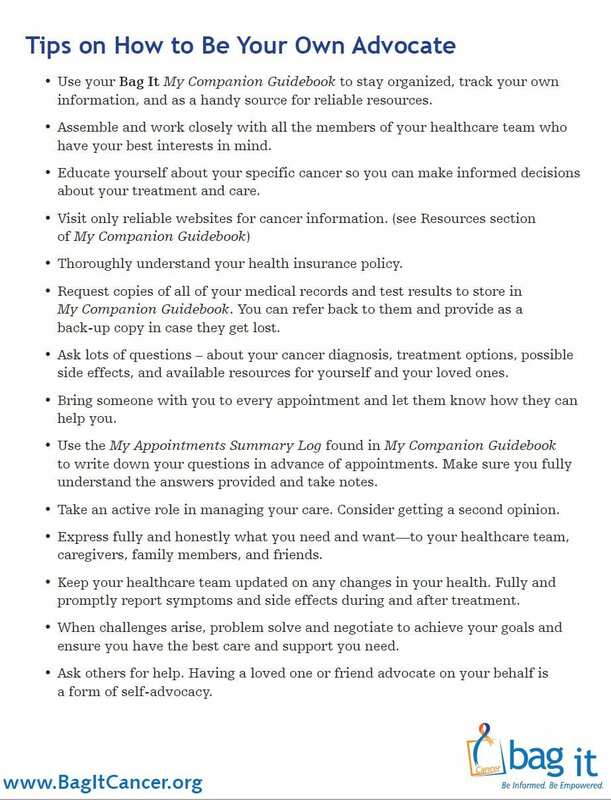 As a cancer patient, you engage with dozens of medical providers, who are all working as part of your team. Self-advocacy is about empowering you to be the leader of that care team. Information is power—if it’s the right information. Bag It can serve as your first stop when you’re searching for reliable, respected, researched, and updated information available on a wide array of topics related to cancer. The following organizations contributed content to the Bag It bag. These forms are included in each guidebook, along with tabbed sections with helpful tips. You can also download extra copies of the forms you use the most right here. in the back of your My Companion Guidebook, or you can complete an online survey in either English or Spanish.